Hi Peeps…………………..well I’m here to tell you that even this old guy occasionally still gets a blog award that he has NOT already received. I kind of thought I had them all and it’s been a while since any “made the rounds” but I was quite excited to receive TWO blog awards this week from a Romance Writer who follows my blog – Diane Wickles! BUTTTT, before I tell you all about that, check THIS out – GUESS WHO IS CAT OF THE WEEK AT BIONIC BASIL’S ????? That’s right – yours truly…………….. CLICK HERE ! Thanks Basil for making me the star this week. How cool! Put award logo in post. Answer 7 questions by person who nominated you (my questions are at the end of this post). Nominate any number of bloggers (with their links). Let these bloggers know you nominated them by commenting on their blogs. Premio dardos means “prize darts” in Spanish. It is given for recognition of cultural, ethical, literary and personal values transmitted in the form of creative and original writing. Post award on your blog with the name of the person who gave you the award and link to their blog. Pass the award onto 15 worthy blogs. Needless to say, I’m particularly interested in the Premio Dardos because it has a lot to do with my actual writing of my blog (which of course I do myself without Mom’s help because I not only have THUMBS so can operate the keyboard well, but I’m exceptionally SMART………you knew that, right????). So since it’s been a while since I’ve done this, HERE are my Mom’s answers (in Red) to the questions that Diane asked for her recipients of the “Real Neat Blog Award” ! Would you rather read a book or watch tv? What are some of your favorites? Read a book…..I love all thrillers/mysteries….Jonathan Kellerman, Kathy Reichs, Agatha Christie – and trust me the list goes on and on and on. Are you a morning person or a night owl? Morning – definitely – we get up at 4AM every day! If you won the lottery what is the first thing you would buy? I wouldn’t buy anything as a “first thing” I’d give a huge pile of it to the shelter in Sammy’s name then I’d probably do some remodeling of our house and re-landscaping of our yard! Selfish? Maybe but this is where Sam, my husband and I intend to STAY FOREVER. 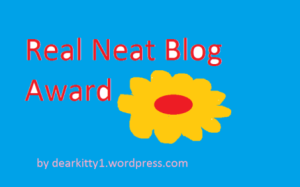 I’m going to offer this blog award (since there’s no requirement as to how many) to anyone who would like to fulfill the rules of acceptance………..which are easy peasy. Some of you do awards and some don’t but ALL of you in my mind deserve the award so please take it if you want it!!!! 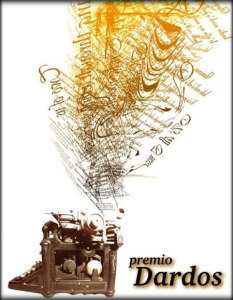 For the other award, “Premio Dardos”, I have put Diane Wickles link above but will repeat it here AND thank her again for the honor of nominating Sammy! No questions to answer. I’m also supposed to pass it on to 15 other bloggers and again, not knowing who wants awards and who doesn’t, I’ll leave it to you if you’d like to have it for your award collection! If you could live anywhere in the world, where would you want to live and why? What’s your all time FAVORITE gift you EVER received? Do you think animals and humans reincarnate? Do you think there’s life on other planets? Do you enjoy OUTDOORS or being INDOORS the most? There you have it kiddos……….I hope some of you decide to take the awards………..I’m serious when I say you ALL deserve them – you’re all my friends and I SO appreciate that you follow my humble little blog……………….you’re the BESTEST! 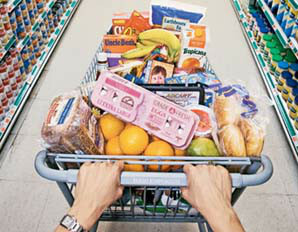 A reminder that tomorrow is Bacon and Fozziemum’s “Shopping Around the World” blog post day…………………here are the items you need to list the prices of in your blog tomorrow – by the way, if you can’t get the prices at your local store, just look them up online! That works too! Then link your blog post to Bacon’s and enjoy seeing all the prices for the SAME STUFF from around the world! Random condiment of your choice. Random frozen meal of your choice. Random dessert/something sweet of your choice. Random Fruit of your choice. Random Item of your choice. Congrats on two well-deserved awards! Big ConCats on the awards, Sammy! You do deserve them both! Uhoh…….boiler replacement is a BIGGIE…….I hope your Mom gets that thermostat figured out so you don’t get TOO HOT or TOO COLD! I hope your Mum accepts the challenge of taking one or both of the awards – like you I love love love reading answers to questions and I tried to make MY questions interesting!!! Congrats on the awards Sammy!! Thank you dear Misaki…..please take them if you like!!! Hi Easy!!!! Mom and Dad are both BIG readers…..there are so many favorites they couldn’t even START to list them all. Is DCI Barnaby the guy in Midsomer Murders? Mom and Dad watch that!!!! We love Midsomer…..and Inspector Lewis……and Detective Montalbano (Italian mystery)……and like maybe 87 more! Oh yes – we are familiar with Commissario – one of our favorites in fact and especially my Dad loves the pretty ladies (woo hoo) AND the restaurants…..
To be honest, we think American TV in this category is stinky compared to EVERYWHERE else…….Maigret is another one we like……so many shows and not enough time to see them all!!!! Gosh then I could have even MORE naps! ConCatulations on those great awards!! We’ve never seen either one of them before. Me neither!!! Please help yourself if you’d like one or both!!!! Wonderful to see your Mom’s answers to the questions, Sammy. Congrats on both awards! Thanks Snowy – oops I mean Sundae!!!!! Great answers! I am learning a lot about you and your Mom today. I read your interview on Basil’s blog- very interesting. Glad you liked my “facts and figures” !!! It was fun to do and fun to receive two awards I’d never heard of too! If you’d like to have them purrrrlease do! ConCATS on the awards! And the interview! We always enjoy learning more about our furiends. Thanks for the concats!!!! It’s weird because the “reply” box popped up but I could never type anything in it! This morning it was “normal” again and I was HAPPY!!!!!!! P.S. Thanks for the shout out for Shopping Around the World. It’s going to be a great fun day! Mom and I just worked on my post for tomorrow Bacon! See you there!!! Oh Doods, if Mom won the lottery I’d be ROLLING in bacon…..imagine that……WOW……..so keep your paws crossed for me will ya? If I win I promise to send lotsa fresh fishies your way too! Have a good Tuna Thursday and an even BETTER Flounder Friday! Wow, Sammy! Congrats on the double win. Love the list of Q&A. Hi Sarge! Please feel free to take an award or two……..!! Congratulations on both awards Sammy! Hugs! Thanks Miss Pix!!!!! We got snow – two more inches of the danged stuff but it’s stopped now……and it’s (like the wicked witch) MEEEEELLLLLLLTTTTTTTING! I TRY to get my peeps up at 4 am every day, but it never works. Never.Congrats on the award! -Crepes. Congratulations on your awards, Sammy! Thanks Summer – these are NEW ones on me!!! Great post Sammy (and Mommy). Kisses right back at you!!!!!!! Pawsum posty Sammy. Fank you, me is honored to accept da awards. And me can’t wait to see evewypawdy’s choices and purrices tomowwo. Concats on your awards Sammy. I saw and enjoyed your interview over at Basil’s too. My mum is a night person. She doesn’t usually go to bed until 1.30. She doesn’t like mornings at all but has to get up to turn the horses out. Thanks Flynn………My Mom has always been an early bird BUTTTT her sister is a night owl and keeps hours like your Mum. Thanks for reading my interview with Basil….that was FUN to do!!! Congrats on that cool award, Sammy! hi Cody!!!! Thanks buddy………..I didn’t think there were any other awards that someone hadn’t given me but then I get TWO that I’d never heard of! NEVER SAY NEVER……..
Shopping is fun and I like when my Mom reads because that means her lap is available for LOOOOOOOOOOOOOOOOOOOOOOONG periods of time!!!! Mom says that’s why her bladder is rubbish now – from all those years of “not wanting to disturb the kitty” and holding it!!! Same here that and four kids hahahaha yikes..we may need some exercises 🙂 !!! ConCATulations on the award Sammy!! We love awards where you have to answer questions. Now when is your mom going come visit us in South Africa? Oh wouldn’t that be fun?! She’s never been there or even anywhere near there but there’s plenty of years left on her timeclock so who knows??!!!! My Mom had a tough time coming up with her favorite spot too…..but she said the minute they arrived in Venice on the train and she walked out and saw the water and the buildings that she just MUST have lived there in a past life…..she felt “at home”…………they also loved Switzerland – Lucerne was lovely……………the world is a BEAUTIFUL place (I quite like my world here in my house though!!!). Conkatss on thee awardss Unccle Sammy!!! You totallee deeserve them beecause you are thee very best Unccle inn the werld. Yur Mumma iss way cool too…. OK maybee wee stick to 6 A.M. then mew mew mew…..